According to numerous published reports, Joe Girardi and the Yankees are in the process of finalizing a three-year contract extension worth around $9.5 million. The wisdom behind retaining Girardi is certainly debatable, especially after a postseason that featured so many questionable decisions, but what is clear is the Yankees have adopted a philosophy of managerial stability. 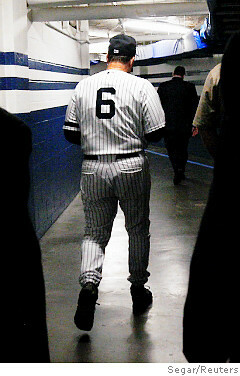 Joe Torre's departure cast a shadow, but Joe Girardi managed to step out from under it (Photo: Reuters). Being the man who replaces “the man” is always an unenviable task, so the fact that Girardi survived his initial three year deal is accomplishment enough. After 12 successful years under Joe Torre, it wasn’t difficult to imagine a scenario in which Girardi failed under the weight of the comparison, especially after the team did not make the playoffs in his first season. Instead, Girardi rebounded and now appears on his way to another three seasons behind the manager’s desk at Yankee Stadium. Even if Girardi only serves one day of his new contract, he will surpass the tenures of the three other men who were called upon to replace legendary figures in the team’s history. Ralph Houk only lasted three years after replacing Casey Stengel (Houk would return for an eight year tenure starting in 1967), who like Torre was “pushed out” after serving as manager for 12 seasons. Miller Huggins also lasted 12 years at the Yankees’ helm, but his replacement, Bob Shawkey, only survived one. Finally, no one left a bigger imprint in the manager’s chair than Joe McCarthy, whose 16 seasons as skipper is a franchise record. Bucky Harris followed McCarthy, but was gone after two seasons. 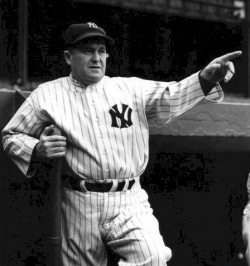 No one lasted longer as Yankees’ skipper than Joe McCarthy, whose 16 year tenure as manager is a franchise record. Incredibly, the Yankees have only had one instance in which the tenures of two consecutive managers lasted at least four years: an honor held by Buck Showalter (1992-1995) and Joe Torre (1996-2007). If Girardi survives the term of his contract, he would not only squeeze his way into that grouping, but also become only the sixth Yankees’ manager to serve in the role for six consecutive (full) seasons. From 1973 to 1991, the Yankees had 12 different men serve as manager over a span that included 19 different regime changes. By comparison, the recent era of stability (three managers in 19 seasons) is dramatic, although it does pale next to the span from 1918 to 1960 in which the team had only five skippers (aside from interims required by Huggins’ and McCarthy’s deaths). 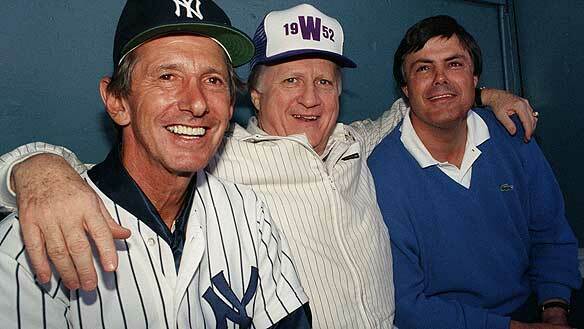 Being Yankee manager did not provide much job security under George Steinbrenner's early days as owner. It remains to be seen just how long Joe Girardi will last at the Yankees’ helm, but if he remains successful, the climb up the franchise’s managerial ranks might not take that long. In retrospect, that reality makes earlier speculation about Girardi bolting for the Cubs’ job seem even more implausible. In this new era of stability, Girardi has a unique opportunity to leave his mark on the franchise’s storied history and its hard to imagine any scenario in which he would willingly pass that up. Then again, Girardi’s ultimate legacy might not be defined so much by wins and losses, but how he deals with the twilight years of an aging core of Hall of Famers. Just like McCarthy with Babe Ruth, Stengel with Joe DiMaggio and Houk with Mickey Mantle, Girardi could be called upon to shepherd Derek Jeter, Jorge Posada and Mariano Rivera through the inevitable end of their prolific careers. That task is easily the greatest challenge of Girardi’s second tour of duty, and it could be the one the determines whether he has a third. 1 Houk served two separate terms as manager: 1961-1963 and 1967-1973.